Diane von Furstenberg has long been seen as an empowering fashion force, from the invention of her easy wrap dresses in the Seventies to her support of young designers in her role as CFDA president, but now she is set to take the idea a step further, by launching the DVF Awards. The new awards scheme will recognise women whose leadership skills and vision have had a positive impact on the lives of other women around the world, with prizes presented at an annual ceremony. "Women never cease to impress and inspire me," the designer said, "and I am very happy to create these Awards to honour and reward their leadership and dedication to the advancement of women." Each honouree will receive $50,000, aimed to help them sustain and expand on their humanitarian efforts. The first DVF Awards ceremony will take place at the United Nations on March 13 and will honour four women. Two are from the Vital Voices network - Sadiqa Basiri Saleem, who established a learning centre in Afghanistan, and Danielle St. Lot, Haiti's minister of commerce, industry, and tourism - whilst the People's Voice Award will honour an American woman to be voted for by the public at www.facebook.com/dvf. The fourth recipient will be announced on the night. "These are women who have shown the courage to fight, the power to survive, and the leadership to inspire," von Furstenberg added. 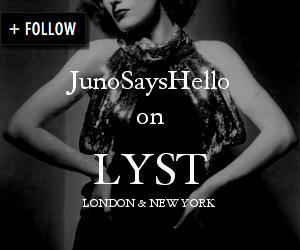 Enter Juno Says Hello's first competition!